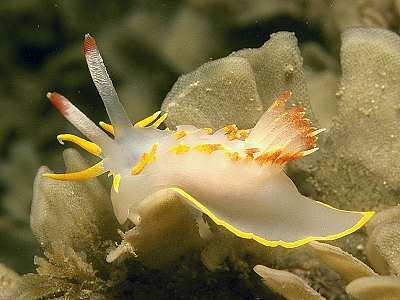 Description: The maximum recorded length of this attractive nudibranch is 80mm. The body is white, suffused with pink in parts, varying to red in some individuals. Finger-like processes project from the head the edges of the mantle and the middle of the dorsum. These processes are orange with yellow or white tips. There is a yellow band that runs around the edge of the foot. The lamellate rhinophores are rosy in colour with yellow tips. 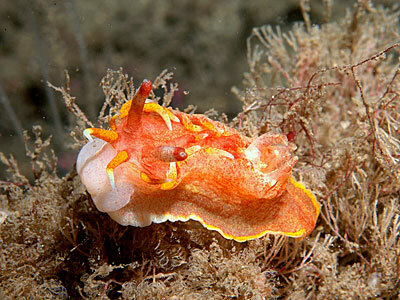 Habitat: This nudibranch feeds on the ascidian Polycarpa scuba. It is often found burrowed inside the test of the ascidian, with only its gills protruding. 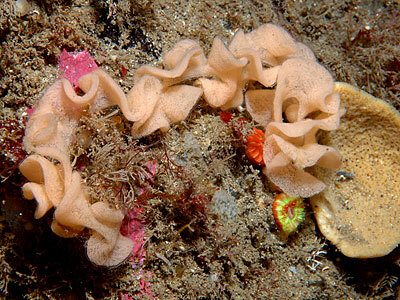 The spawn consists of a pink ribbon which is irregularly and loosely coiled. Distribution: A rare species in the British Isles, Okenia elegans has been found at scattered localities in SW England, Skomer Is., the Saltees in Co Wexford and the Skerries, Portrush, Co Antrim. Long processes arising from the mantle edge and the midline of the back. White or red body with yellow-tipped processes. Picton, B.E. & Morrow, C.C. (2016). Okenia elegans (Leuckart, 1828). [In] Encyclopedia of Marine Life of Britain and Ireland.